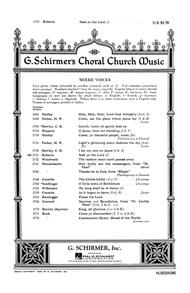 SATB with organ and tenor solo. Composed by J. Varley Roberts. Choral. Sacred, Inspirational, Classical, Contemporary. Octavo. 8 pages. G. Schirmer #OC3731. 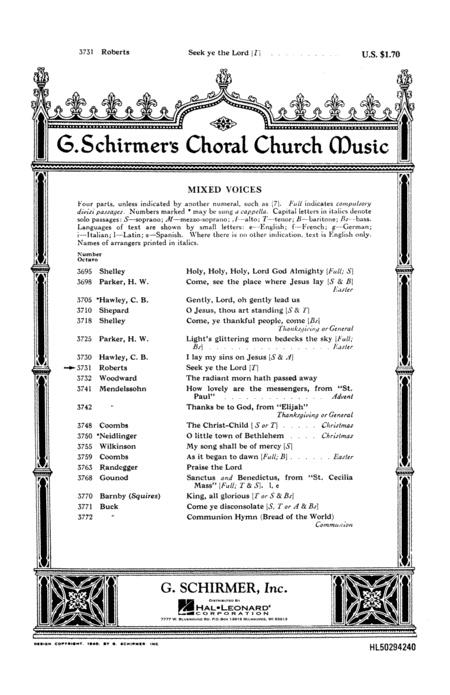 Published by G. Schirmer (HL.50294240). receding with the age old message of God's love and mercy in return for man's repentance. The lyrics are wholly (holy) written by God through his prophet, Isaiah. I highly recommend to you the anthem's performance by the Bryan College Chorale of Dayton, TN as found on YouTube. Enjoy. Love this piece. Heard it sung by a tenor in our church many years ago. Vowed I would someday sing it. I'm a soprano and will finally get to fulfill my wish. I don't believe it's too difficult for anyone to learn. This is a beautiful, beautiful anthem. Tenor part is high for some. I'm doing something different and using a bass voice an octave lower. This is one of those anthems that moves the choir as much as the congregation!